Looking over the maps of Sequoia-Kings Canyon, the Kaweah Basin called to me. It was the largest trailless area that I had never visited. I had been all around it, but never into it. 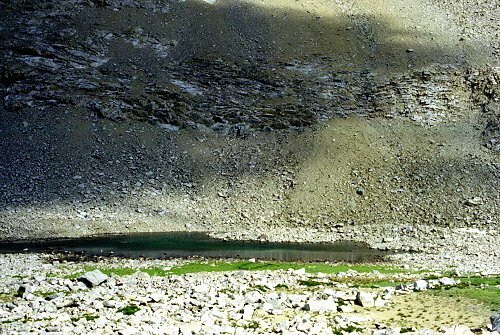 In 1986, I crossed the Chagoopa Plateau, looking up at Mt. Kaweah and imagining that I would one day return to climb it. So I resolved to explore Mt. Kaweah and the Kaweah Basin. 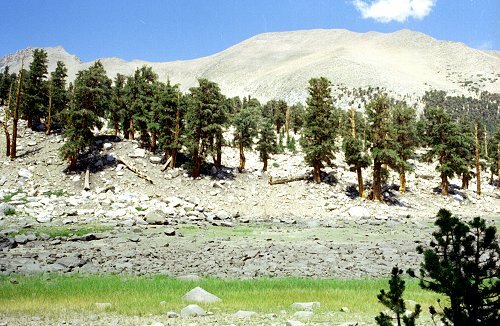 My plan was to travel to the Chagoopa Plateau, pass through Kaweah Pass into Kaweah Basin, then drop into the Kern-Kaweah River basin, follow the trail to Colby Pass, and then make my way back to Crescent Meadow one way or another. 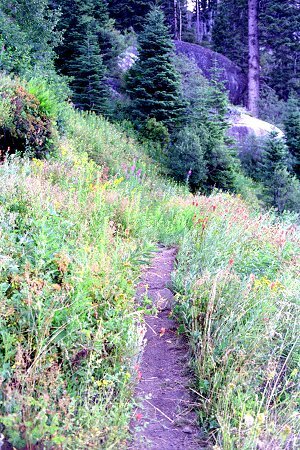 I started early at Crescent Meadow, getting on the trail well before sunrise to avoid the heat. The walk to Bearpaw is pleasant -- almost level, shaded, with glimpses of the valley off to the south. The next morning I again got an early start from Bearpaw. I like to get away before anyone else is out of bed. The wildflowers were spectacular this year. I guess springtime is only a few weeks long, followed by a couple weeks of summer, another few weeks of fall. It is a real treat to see all the flowers. The real climbing starts after Bearpaw. I was almost to Hamilton lake before I got into direct sun. Here Angle Wings is gleaming white in the sunlight, while I am still in shadow. I passed Hamilton Lake just as most of the people there were eating breakfast. In the hot sun and with the trail steepening, I was definitely slowing down. Above Hamilton Lake the trail has to get around a really steeped canyon. 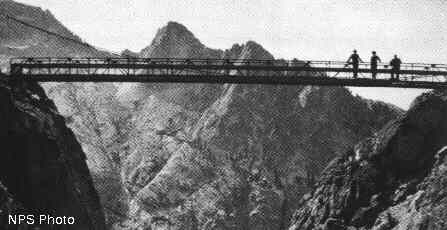 At one time, there was a suspension bridge across, but it was demolished by an avalanche in a couple years. I snagged a picture showing what it used to look like. It looked terrifying to cross. After that, the park service built this great cutaway trail with a tunnel. After passing through the tunnel, the trail continues to ascend. Here is the face of Angel Wings from higher up in the canyon. 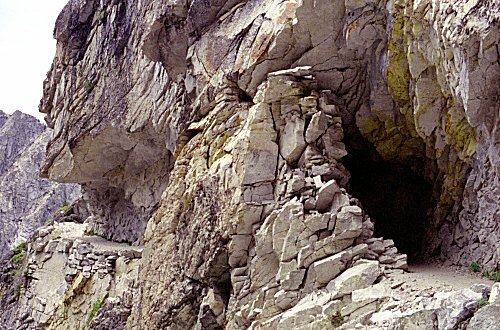 The side canyon with the tunnel is between where the picture was taken and the trail visible in the center. The trail continues to ascend past a series of lakes, up above the tree line. 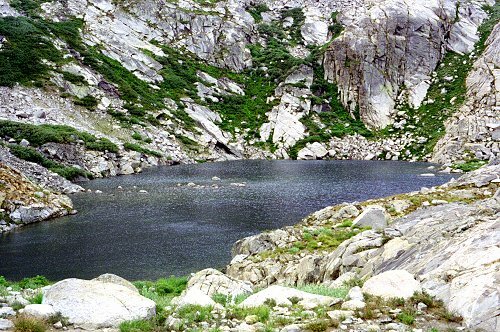 The most picturesque of these lakes is Precipice Lake. The lake is surrounded by cliffs, a small part of which is shown here. I had another party snap my picture. I spent the night near one of the lakes in Nine Lakes Basin. I did not see anyone in the vicinity. The party that I had met at Precipice Lake was headed for Big Arroyo Junction, and I never saw them again. I was still feeling very strong, and made great time in Big Arroyo towards Chagoopa Plateau. I got to the plateau at about lunch time, well ahead of schedule. I ate lunch at the dry lake, and then took off on my own, trying to maintain elevation as I contoured around the south slope of the mountain. I camped at a wet meadow just west of Chagoopa Creek. It was a nice place to stop, one of the few places with a water supply. Unfortunately there were plenty of mosquitoes. I spent the afternoon napping and resting up. 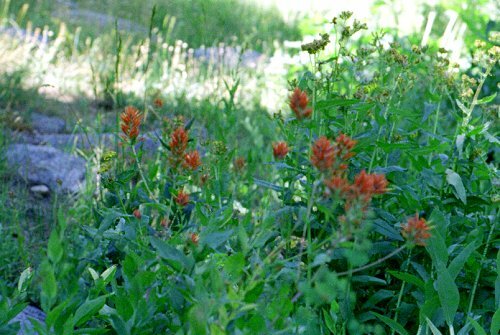 The meadow was just about at treeline, at the junction of the slopes of Mt. 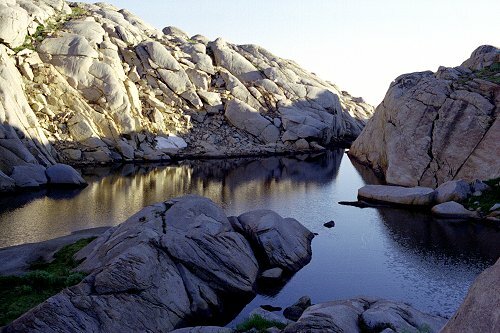 Kaweah and Chagoopa Plateau. The next morning brought clouds. I decided to see how far up Mt. Kaweah I could get. The sun breaking through the clouds make for dramatic scenery. 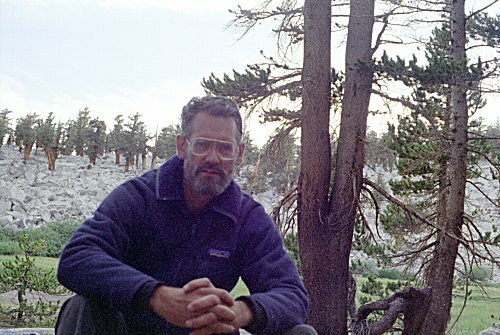 This was taken at the upper boundary of the treeline on the south slopes of Mt. Kaweah. 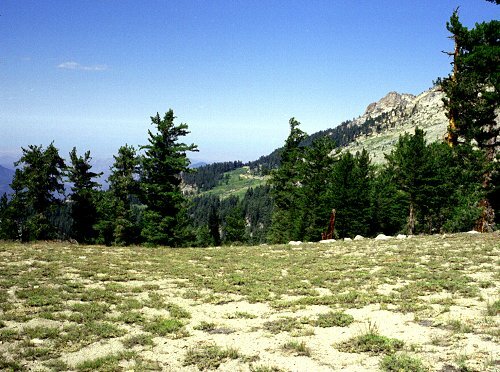 The view is across Big Arroyo to the mountains in the Mineral King area -- Sawtooth, Eisen, Lippencot, etc. Black Rock Pass is there somewhere. 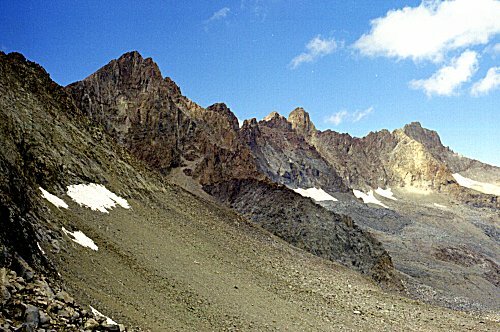 The south side of the Kaweah Peaks Ridge is hard granite, light, yellowish, decomposing into sandy slopes that are tiring but pose little technical challenge. The north side is highly colored and much steeper. This picture, looking west along the ridgeline, shows the contrast. From the top of the ridgeline, Chagoopa Plateau is clearly visible. Across Big Arroyo is the Great Western Divide. 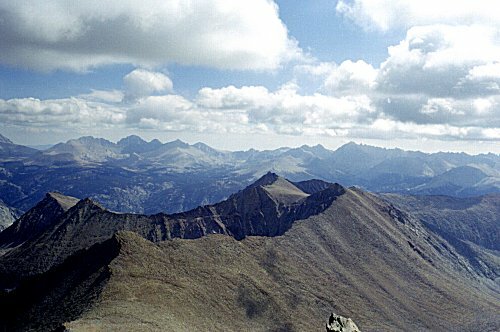 Looking east from Mt. Kaweah is Red Spur. It almost looks like volcanic rock from this vantage point. A little farther to the north from red Spur is the Kaweah Basin itself. This shows the eastern half of Kaweah Basin, which is divided by Pickett Ridge, the second ridge in the center-left, the one with a red stain showing. The ridge in front of it extends from Kaweah Queen. Between the two lies Pickett Creek. 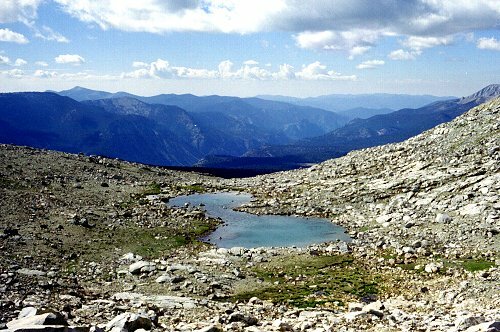 I study this view because I am aiming to cross the first ridge into the basin of Pickett Creek, from where I will exit Kaweah Basin. I decide that the gap in the ridge, just about in the center of the picture, looks like a good place to cross. From the top of Mt. 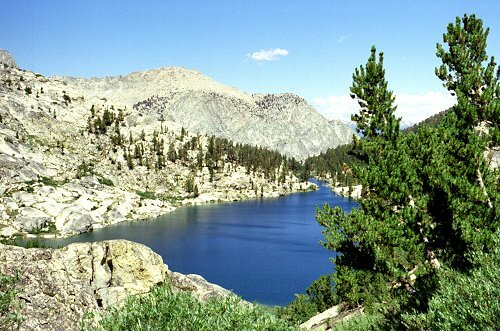 Kaweah, I also study Kaweah Pass, which I will be descending tomorrow. This view is looking essentially straight down. the big lake on the right is 1200 feet below, at the top of the pass. 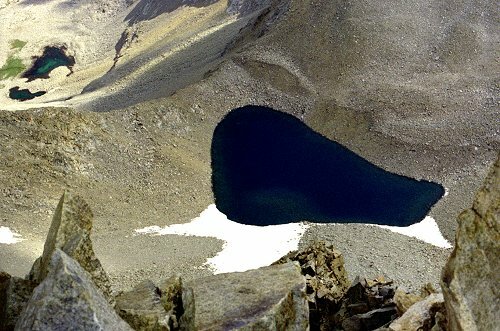 The smaller lake in the center is another 1000 feet below that, and is at the foot of the pass. Note the two sets of cliffs protecting the lake. The bottom cliffs are not visible from the pass or on the route down, not until you get to the immediate vicinity. 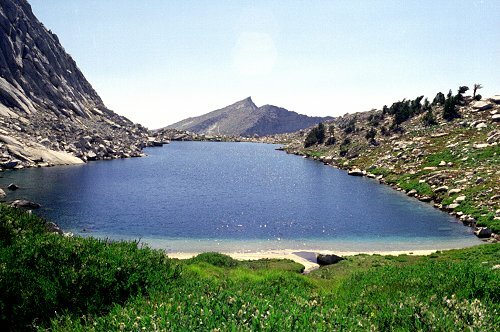 Here is another view of the lake and of the pass to its left. After descending, I spent the rest of the day resting. I had no trouble finding where I had camped, because I had made careful mental notes on the landmarks along the way. When I retraced this route in 1997, I had access to an altimeter which made it much harder to get back to camp. 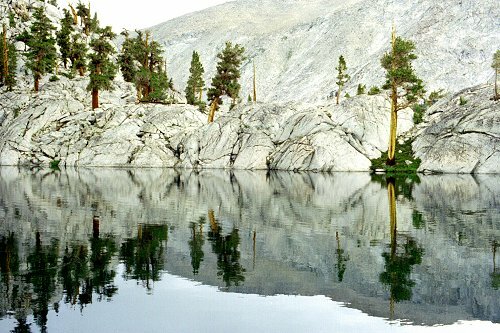 The next morning I pushed on to Chagoopa Creek, and followed it up toward Kaweah Pass. 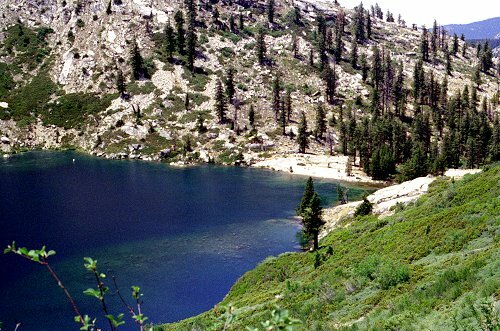 There were a series of charming lakes along the way, forming stairsteps -- flat areas interspersed with steep climbs. 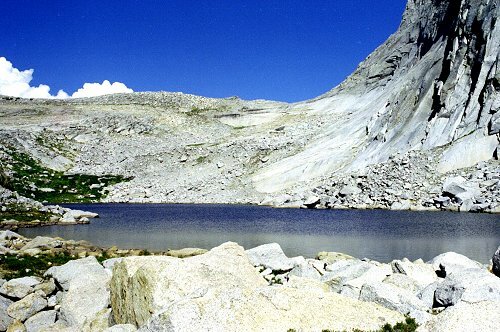 As I reached the lake near the top of the pass, the nature of the rock changed markedly. 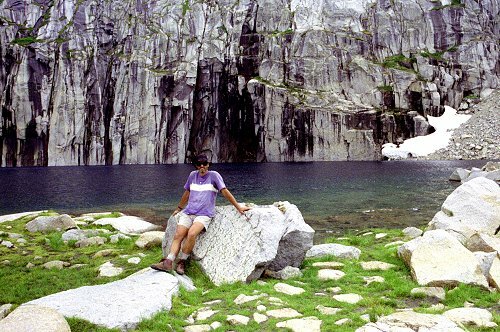 The monolithic blocks of decomposing granite were replaced by more brittle chunks of dark rock, which were hard to walk on and which would shift underfoot. Getting around the lake was an unpleasant, exhausting exercise. 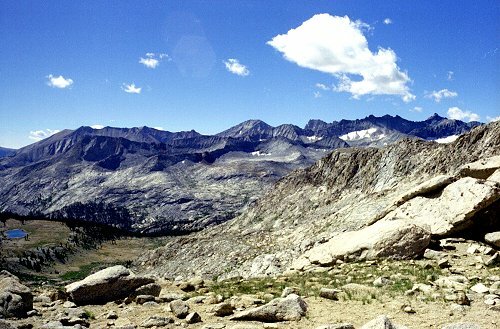 Once I got to the pass, I was rewarded with the view of the Kaweah Peaks Ridge from the other (north) side. As I said earlier, this side is highly colored, steep, fractured rock remarkably different from the opposite slopes. 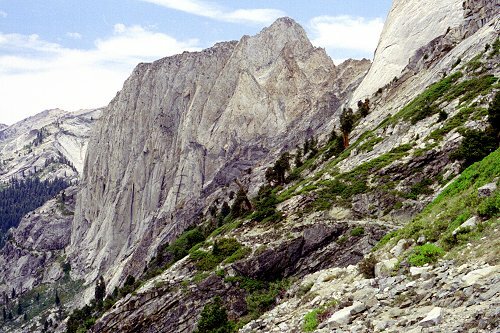 The descent of Kaweah Pass was scary, in part because the rock was so steep and so loose. The highest part, the cliff just below the pass, was exceptionally steep and scary. This picture shows the route I took. From the lowest part of the pass, I descended just slightly to the left of center, to the left of the snow patch in the center. I came directly down the slope from there until I reached the second set of cliffs, which can be seen at the left here, and which are shown from below in the next picture. I skirted around the top of the cliffs, looking for a way to descend. I did not find one, but instead came all the way around to the lake pictured here. 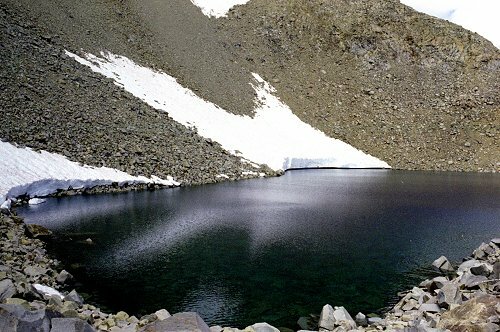 From this lake, I was able to descend further. 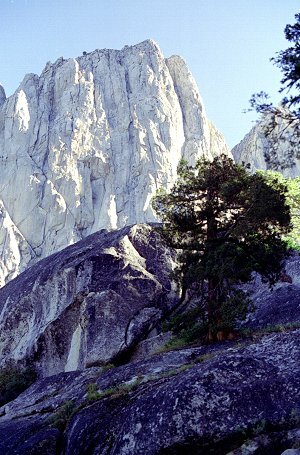 This shows the lower part of the descent of Kaweah Pass, the second (lower) set of cliffs. I crossed from left to right at the top of the cliffs, eventually avoiding them entirely. The weather was threatening rain, so I stopped at the first level spot and set up my tent. It only rained a few minutes, but the clouds were blowing over the ridge all afternoon. The next day I explored the upper part of Kaweah Basin before heading on down. 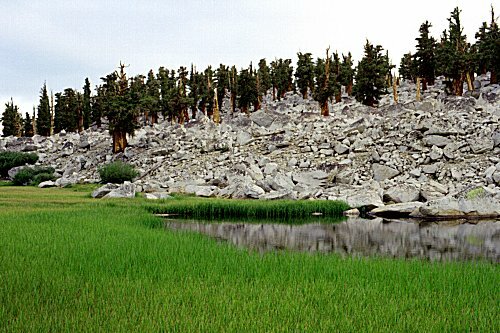 Most of Kaweah Basin is above the tree line, and seems wild and remote, just what I had been expecting. I saw few signs of trails, ducks, or previous visitation. 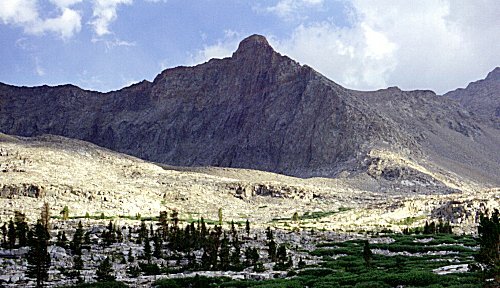 This is Red Kaweah, another peak on the ridge. I crossed into Picket Creek basin without difficulty, and descended to the edge of the drop-off. This lake is perched right beside a big cliff: the mountainside in the background is on the other side of a valley that drops 500 feet just beyond the trees nearby. I camped near the lake so that I could scout out ways to get down into the valley. It turned out that the drop into the basin of the Kern-Kaweah was not as challenging as I had expected. I veered west diagonally across the slope, and never encountered the steep cliffs I saw on the map. I was relieved to be back on a trail again, and cruised right up to the vicinity of Colby Pass. I took a detour off the trail, staying the night at a little lake on a bench above the canyon floor (shown at the left of the picture here). 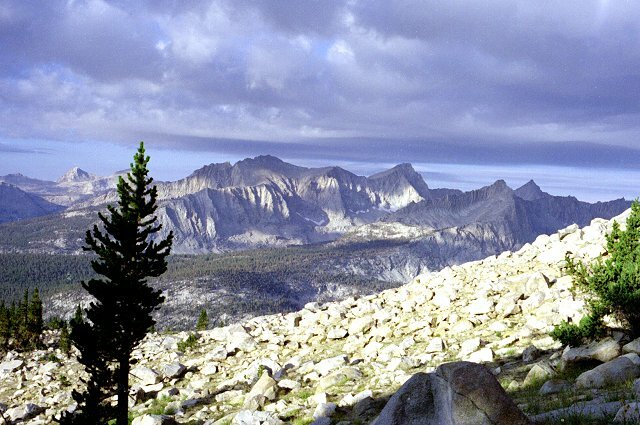 This picture also shows the Kaweah Peaks and the Kaweah Basin. Crossing Colby Pass, I came to Colby Lake about midday. I was enjoying hiking on the trail: although sometimes I love getting away from it and exploring remote areas, at other times the stress and worry take away from the pleasure. I guess the descent from Kaweah Pass left its mark on my psyche. 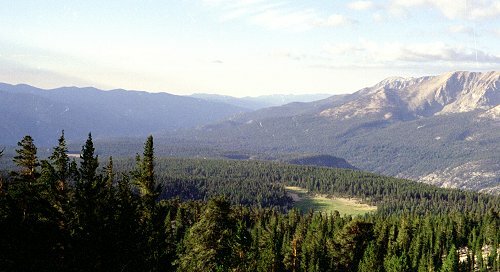 I needed to get to Crescent Meadow in four days, and there were several options. 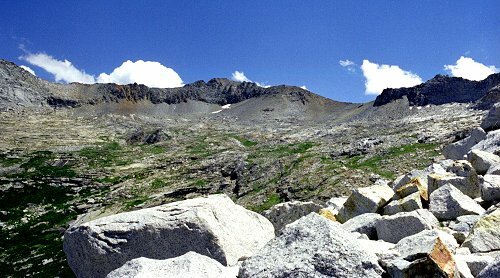 The shortest way would be to cross Coppermine Pass, Elizabeth Pass, and hike back from Bearpaw. Alternatively, I could head down Cloud Canyon to Roaring River and go back via Silliman Pass. I decided to stay on the trail at this point, and to head to Roaring River. It was pleasant to be going downhill on a good trail. I reached Roaring River having met no one on the trail since Precipice Lake. I decided to return Via Deadman Canyon and the Tablelands. To get a headstart on the next day's ascent, I started up that afternoon, camping in a little hidden area next to the stream. 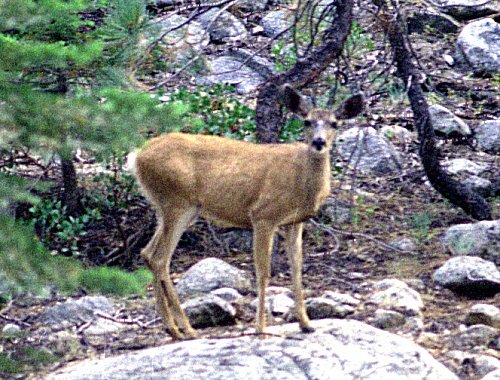 I spotted much wildlife in Deadman Canyon that day. 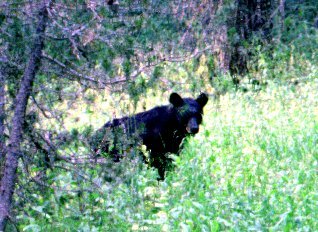 I saw this bear cub, took a picture, and discovered that I needed to reload the film. While I was doing so, two more cubs and an adult showed up. I backed off and let them pass. Here is the grave that gives Deadman Canyon its name. I made excellent time up Deadman Canyon, reaching the vicinity of Elizabeth Pass shortly after noon. I climbed to the head of the bowl and turned off toward Lonely Lake. 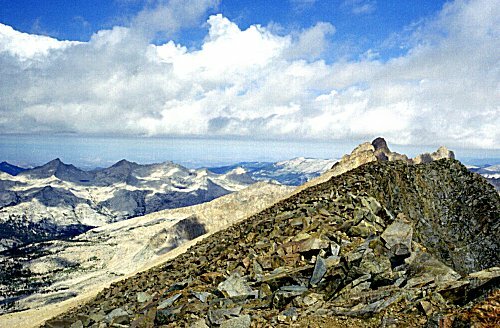 This picture was taken from that vicinity, showing the Coppermine Pass route (the colored rocks on the ridgeline to the left). 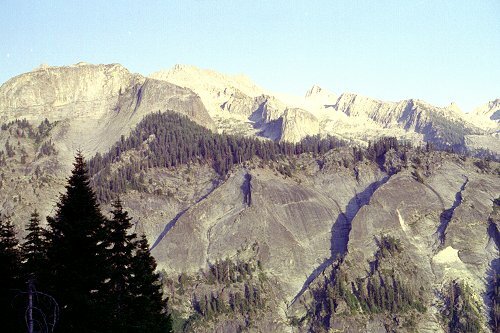 The copper mine is on the ridge line about in the center, and Elizabeth Pass is off the picture to the right. Lonely Lake, as always, was stunningly beautiful. I took a quick dip in the cold water on the beach, before heading around to camp at the other end of the lake. 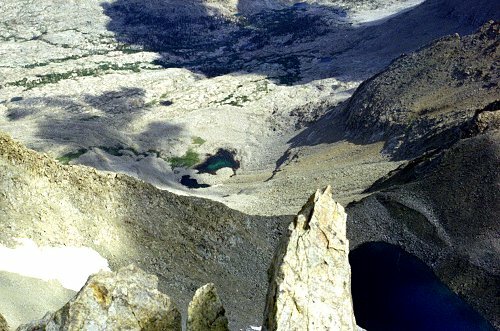 Looking back along Lonely Lake, you can see the pass into Deadman Canyon and the route down the huge rock slabs. Clouds continued to well up behind the ridgeline all afternoon, but I continued to have clear weather on my side. The view west from Lonely Lake encompasses most of the Tablelands, and the area beyond. 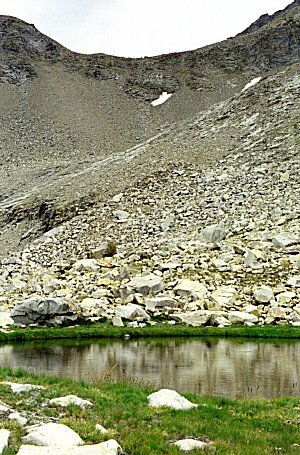 The lake in this picture is Moose Lake, with Alta Peak behind. The next day I crossed Pterodactyl Pass into the Tablelands. I wandered around, exploring various sights as the spirit moved me. In the late afternoon I came across this picturesque little lake, and decided it was a good place to stop for the day. I took my last look at the Kaweah Peaks Ridge from this vantage point. The next day I headed for Moose Lake, arriving before noon. I filled up my water bottle, and headed for the Alta Meadow trail. I had never been on this route before, but the map showed a trail, so I thought it would be easy. It would have been, too, if I had been able to follow the route. But no matter how hard I tried, I could not figure out the proper route. I constantly found myself fighting through thick brush, reaching steep drop-offs, retracing my steps. Eventually I reached Alta Meadow, still searching for the trail. Back into springtime and pretty wildflowers, my heart sang. Eventually I found the trail and started making good time downhill. 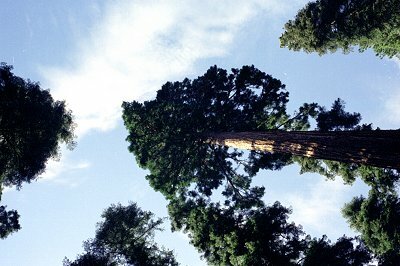 It wasn't long before I was back among trees, then into the Sequoia groves near Crescent Meadow. I started seeing people finally, just a couple miles from the trailhead. 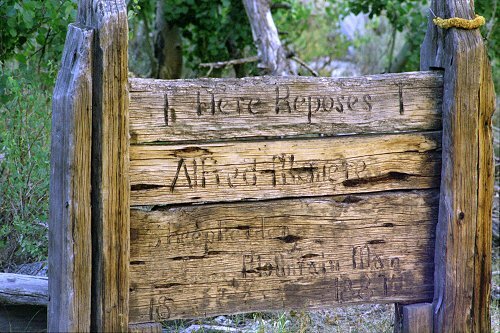 Even though I had passed through Roaring River, I had not met another person for over a week. This is not in the Sierras, but I saw it on my drive back from the trip. 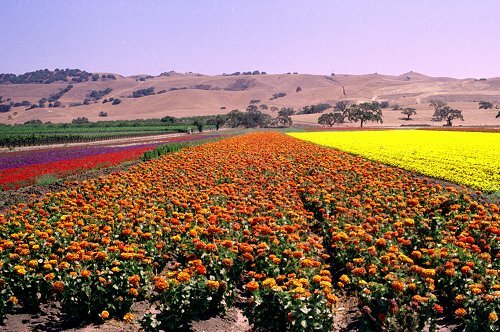 It is apparently a flower farm near Gilroy. It went on and on, and was so beautiful I had to stop and take a picture.